"...the voice in these poems is deeply reflective, defiant, and with doses of insect imagery"
Poetry International (SDSU) carries a micro-review of The Knowledge on their website today. Lorenia Salgado notes "the speaker's intricate response to life's perplexing moments" throughout the book's three sections, and quotes passages from "Nocturne with Writer’s Block" to illustrate various forms of Kafkaesque metamorphosis. Categories: Books and Poetry. 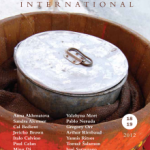 Tags: Poetry International and The Knowledge.